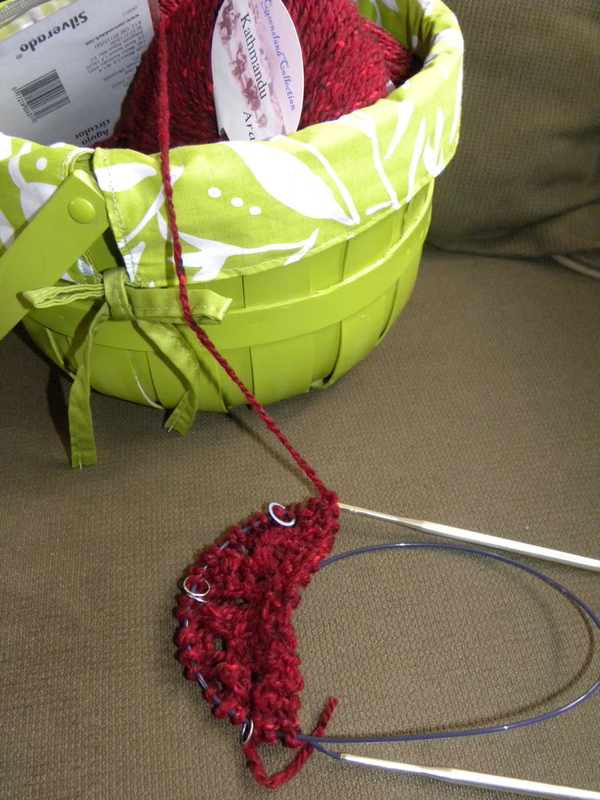 I’ve been itching to knit another shawl for awhile now, but other projects kept getting in the way. (Projects I was actually getting paid to make, so those totally take priority… and happily.) Have I ever mentioned how much I love knitting shawls? You know,… I don’t wear them. I wish I was one of those fashionable girls who can throw a cute outfit together and wrap a lovely shawl around it all and make it come together. I am not one of those girls. I wear jeans everyday (which I can do because I work from home.) If I’m going somewhere nice, I throw a nice shirt on with my jeans, instead of my usual plain V neck T-shirt. I just can’t be bothered, really. Skirts are too cold in the winter (which lasts about 9 months in the Northeast) and in the summer, I opt for capris instead of skirts (just more practical, and I’m not fond of my stubby legs in shorts). I go to clothing stores and leave with nothing, complaining about how everything in there is so ugly. And when I do see something nice, it usually fits me all wrong or looks too girly or whatever. But I love knitting shawls. I’ve only made 4 so far, but each was so much fun, I just couldn’t stop once I started. I gifted 3 of them, and kept one for myself. I wore it once to a wedding, but now it sits at the bottom of a huge Tupperware bin, where no harm can come to it. I’ve been told I should display it somewhere at least, and I’d like to, but it would get dusty or dirty, and eventually need a washing. A washing would mean blocking it all over again and I am NOT going to do that twice. So, although I have no real reason to keep making shawls, I just can’t help myself. Last night I started the Juneberry Triangle by Jared Flood. I’ve been wanting to make this one for over a year. My sister gave me all the yarn to make it with for Christmas. If mine comes out looking anywhere near this good, I just might have to buy an outfit to go with it. 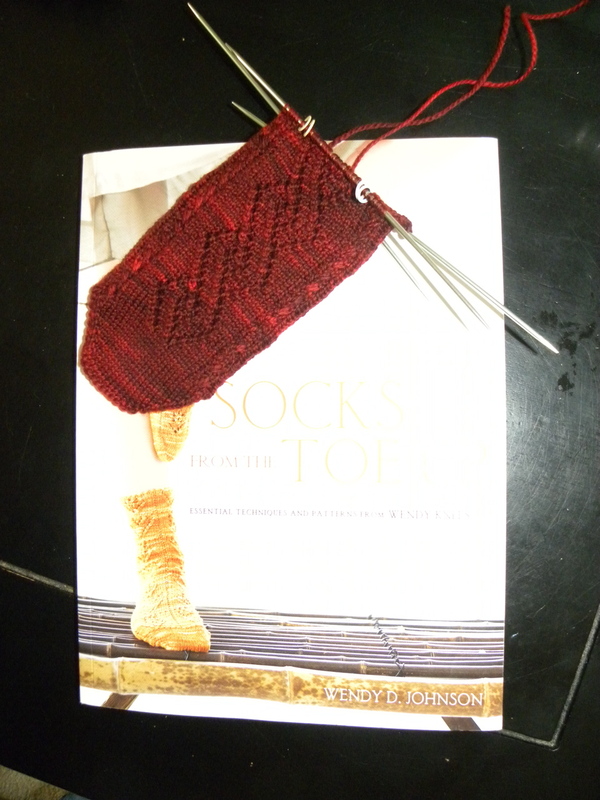 My Lace and Cable sock is coming along. I guess I’m in a red kind of mood. I’d even settle for a RED vest!!!!!!!!!!!!!!!!!!!!!!!!!!!!! Uh, I wear shawls…. And I LOVE red! Just kidding- I don’t really wear shawls… But I might have to start if someone gave me somethin’ like THAT! Love the red! 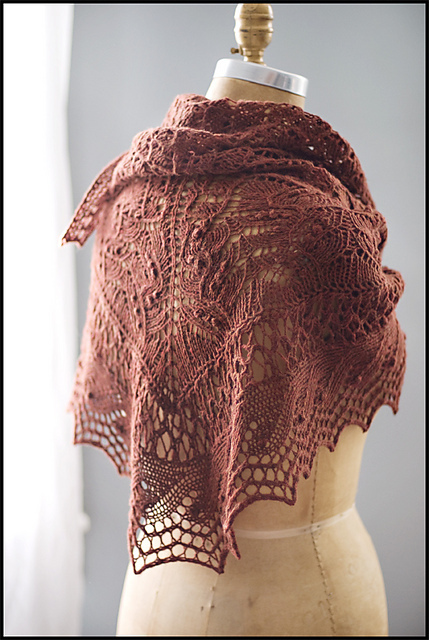 I have that shawl pattern in my queue on Ravelry. Let me know how you like it. Mine’s going to be, uhhh, maybe teal? !